The Ross VMC-1000 VersaMix is a 1000-gal triple-shaft mixer available on a pivot-design single-post hydraulic lift. 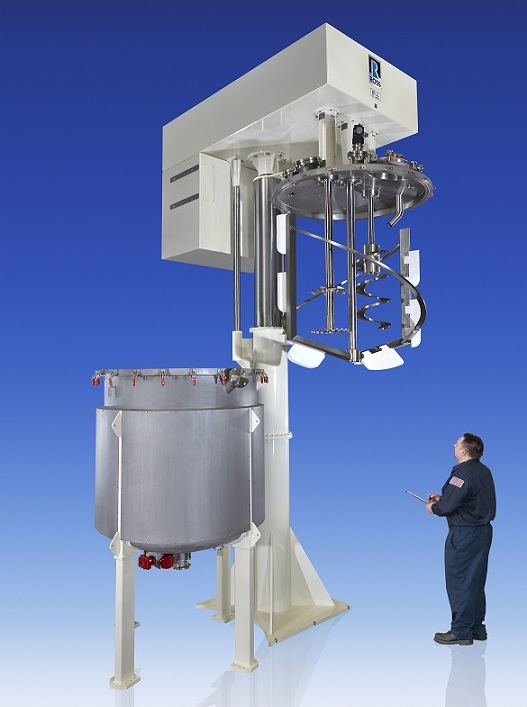 The new design pictured allows the machine to be raised from a vessel, rotate 90°, and lowered into another vessel. This allows for convenient discharge of finished product in the first vessel while a new batch is being made in the second. By reducing overall processing time and minimizing downtime, the pivoting VersaMix saves time and money, while simplifying the mixing, discharging, and cleaning operations. The VersaMix is available across a full range of working capacities from 1 quart to 2000 gal.